We know that elections are coming and politicians’ sweet words seldom translate into real improvements for voters. When the going gets tough, the tough – especially politicians – get out and start pressing the flesh, winning friends and influencing people. 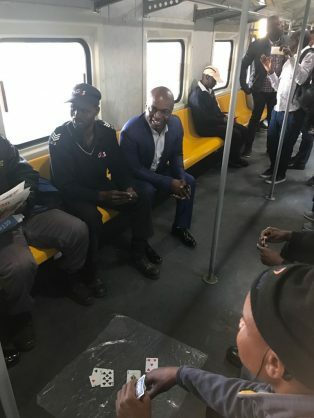 One could look cynically at Tshwane mayor Solly Msimanga’s train-driven “listening tour” this week. After all, he only narrowly survived a proposed motion of no confidence – one proposed by the EFF and one by the ANC – when there was a serious political falling out between those parties. How long he stays safe in his post remains to be seen … but he wasn’t letting uncertainty deter him from his “meet the people” trip, campaigning for the DA to take Gauteng province in the election next year. We know that elections are coming and politicians’ sweet words seldom translate into real improvements for voters – but, at least Msimanga is out there and listening. His counterpart in Johannesburg, mayor Herman Mashaba, is even more visible and energetic in taking the political temperature of his citizens, as well as launching any number of campaigns for change. The critical issue is, of course, whether both mayors continue their work, or whether these performances are literally that – just shallow shows. Gentlemen, the province’s voters will be watching you closely.